In a large Dutch oven (7.5qt for me) over medium heat, combine tomato sauce, tomatoes, onion. In a large skillet over medium heat, cook bacon until slightly crisp. Drain and stir into the pot. In the same skillet over medium heat, cook sausage until brown. Drain and stir into the pot. In the same skillet over medium heat, cook the beef until brown. Drain and stir into the pot. Stir the barbecue sauce and chili powder into the pot; taste and adjust seasonings. Stir in the beans and chocolate and simmer until flavors are well blended. Serve. 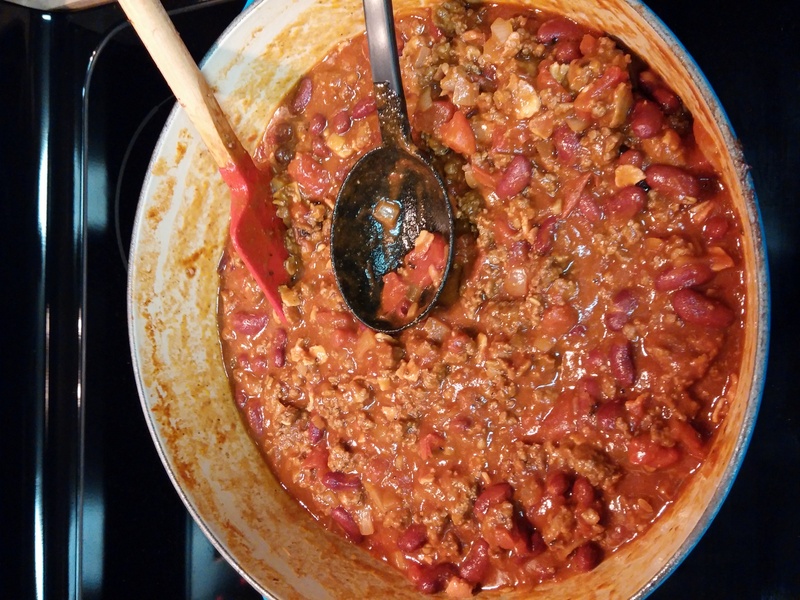 Note – picture shows kidney beans, I have since switched to great northern beans. Next time I make it, I will add a decent picture as well.